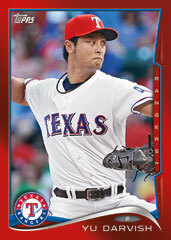 2014 Topps Baseball Series One arrives on Wednesday at Sports Cards Plus. Hobby boxes start at $54.95 while JUMBO BOXES with an Autograph and TWO Relics are ONLY $92.95 per box. Look for all kinds of great cards from The Super Hit Factory. This year you have the opportunity to pull Topps Greatest Rookie Cards of All- Time. The "Rookie Buybacks" include the 1952 Topps Mickey Mantle RC, 1952 Willie Mays, 1954 Hank Aaron, 1955 Roberto Clemente and Sandy Koufax. Also included in 2014 Topps is a new promotion, a Pennant Chase game. Each Major League team will have a card and at the end of the season, collectors holding cards of the pennant-winning teams will be able to redeem the card for a prize. As with past seasons, the base set for Series 1 consists of 330 cards — a mix of veterans, rookies, highlights and more. Each card will have eight parallels with a new Hobby-only inclusion being Clear parallels, which will be printed on acetate and serial-numbered to just 10 copies. The rundown of the rest of the Topps rainbow will include Gold (/2,014), Camo (/99), Black (/63), Pink (/50), Red Hot foil (one in six packs) and 1/1 printing plates and Platinum versions. There will also be silks for 100 players in the set. Postseason celebrations and a small selection of Series Two cards are among the short-printed variations in 2014 Topps Series One. Series One is a 331 cards set, but some of the cards found have numbers higher than 331. Among the high-end chase cards this year are Hobby-only Strata inserts, which include Strata Signature Relics that combine acetate with autographs and game-used pieces. These are serial-numbered (quantity not announced) with a series of Strata cut 1/1s also included. Each of the other inserts have auto-memorabilia versions: Future is Now auto Relics, Upper Class, All-Rookie Cup, Before They Were Great, World Series Champs and Postseason Performance cards to be chased. None of these have more than 25 copies per card, except for the final two, which are limited to 50.